George ELLSE was Wirksworth churchwarden. My great uncle George Ellse was not in Wirksworth in 1901 although he was already in the police. I attach a family portrait. George Ellse and Nellie Peppitt were brother and sister, born and brought up in Chesterfield. The families were quite close and my mother Elsie Peppitt recalled visiting George Ellse in Wirksworth when he was posted there and his daughter Mabel when she lived there. Back row George Ellse and his wife Louisa nee Jackson (always known as Louie). Middle row is Mary Ellen Peppitt nee Ellse (always known as Nellie) and her husband Albert Peppitt. 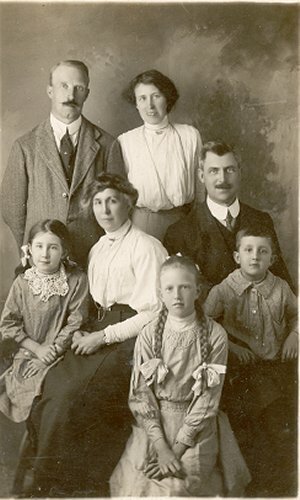 Front row (children) left to right: Elsie Peppitt (my mother who lived in Wirksworth from 1937 until her death in 1999), her brother John and Mabel Ellse daughter of George and Louie. George James Ellse was born in Chesterfield in 1870 eldest son of George William Ellse and Lydia Ann (nee Martin). He was brought up at the Brickyards in Chesterfield. George had something of a falling out with his father and left home and joined the Derbyshire Constabulary. In the 1901 census he was stationed at Hathersage and married to wife Louisa nee Jackson from Belper and had a daughter called Mabel born in Draycott in 1896. George Ellse was stationed in Wirksworth and lived next to the old 'lock-up' on North End. The lock-up later became the surgery of Dr Leslie Fletcher until he retired and I believe is now a private residence. During this time he was a church warden at St. Mary's church in Wirksworth. George Ellse later moved to Buxton where he became a police inspector. Mabel Ellse his daughter married Arthur John Marsden an auctioneer and valuer who lived at Slaley House, Wirksworth. Mabel had two sons. The eldest son born in Wirksworth George Arthur John Marsden born around 1928 (died in Wirksworth in 1998) and a second son Allen born 1926 in Wirksworth. Mabel died in childbirth in 1926. in Wirksworth. George Ellse returned to Wirksworth in his retirement. Louisa had died and he had married a second time to Florence___? He lived up Summer Lane, Wirksworth. I have a faint memory of my great uncle George and think he probably died in the early-mid 1940s.